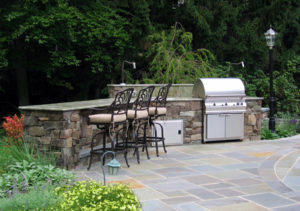 Cipriano builds all your outdoor cookings needs from firepit to a full outdoor kitchen. 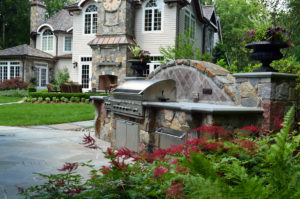 Cipriano Landscape Design will create a fully functional, customized luxury outdoor kitchen for you and your family. 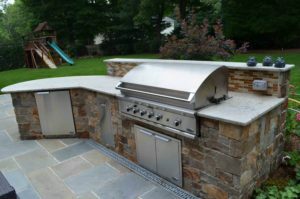 Designed by our on-staff landscape architecture team and constructed with expert detail by our master stonemasons, your luxury outdoor kitchen will go above and beyond any typical BBQ or grill. We design and build custom natural stone and brick outdoor kitchens with all the detail and architectural interest you would find with any “high end” indoor kitchen. We can include every possible appliance for your comfort and cooking needs, including sinks, ice makers, warming drawers, kegerators, and grills, to name a few. Televisions attached to hydraulic lifts and surround sound systems are incredible features for entertaining in your luxury outdoor kitchen. Combined with attached bar seating, these high-end features create a one of a kind destination to eat and drink while enjoying the “Big Game”, a favorite TV show, a movie or music. 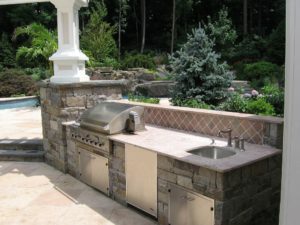 Our diverse portfolio of outdoor kitchen design concepts showcases a range of materials, appliances, and structures that will not only fit your lifestyle but also fit visually into the style of your home and your outdoor living space. Our NJ landscape architecture team uses contrasting materials in their designs to create detail, and depth in your outdoor kitchen. Custom backsplashes, sleek countertops, convenient appliances, and unique ideas give the structures many opportunities to stand out in the landscape and showcase your property. We also have extensive experience with luxury options such as glass tile backsplash and outdoor night lighting to complete the look and atmosphere of your outdoor living area. 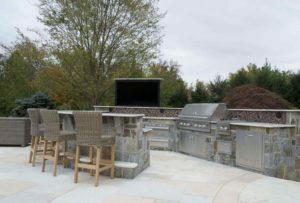 Our masons have constructed nearly 125 outdoor kitchen and outdoor living spaces and installed over 200,000 square feet of natural stone patios surrounding outdoor kitchens and inground pools. Our exclusive masonry design concepts come to life for you with our complete hardscape construction services. Cipriano offers you inground pool and landscaping services in addition to outdoor kitchen design and construction. Our kitchens make the most of your pool and landscape designs by giving you one more reason to stay outside and enjoy the ease and comfort of luxury outdoor living. No need to go inside for dinner. Cook, entertain, and dine poolside with your stunning custom outdoor kitchen and spacious natural stone patio. 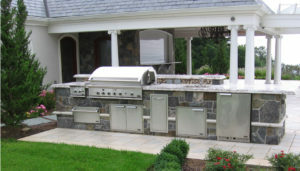 Why trust your outdoor kitchen project with Cipriano Landscape Design and Custom Swimming Pools?